An Egyptian parliamentary delegation led by speaker Ali Abdel-Aal met on Sunday with emir of Kuwait Sheikh Sabah Al-Ahmad Al-Gaber Al-Sabah and Crown Prince Nawaf Al-Ahmad Al-Sabah. 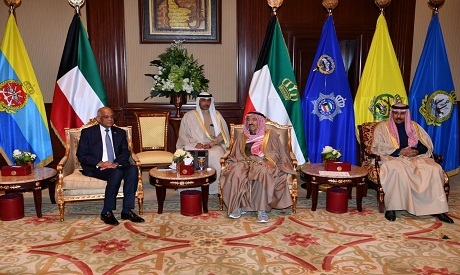 The delegation also held talks with Kuwaiti Prime Minister Gaber Al-Mubarak Al-Sabah and speaker of the Kuwaiti parliament (the National Assembly) Marzouk Al-Ghanem. A press release said that speaker Abdel-Aal extended an invitation to the emir of Kuwait to visit Egypt. "You will be more than welcome in your second country Egypt, and we hope that while you are in Cairo you will visit parliament to deliver a word to the Egyptian people who highly appreciate your role as a great statesman and humanitarian leader," Abdel-Aal said. In response, Sheikh Al-Sabah said that he greatly appreciates the historical and strategic relations between Egypt and Kuwait, which share one destiny and one future. "Sheikh Al-Sabah also stressed that the Arab world is in pressing need for Egypt's pivotal role in standing up to foreign conspiracies targeting Arab peoples and riches," said the press release, adding that "for this reason, Kuwait has always been keen that the relations between Egypt and Kuwait always remain strong." "Kuwait is committed to providing all the financial and political support needed to keep Egypt strong, stable, and flourishing," the emir said, vowing that he will visit Egypt "very soon." Speaker Abdel-Aal said that the Egyptian delegation's five-day visit aims to boost political and economic relations with Kuwait. Abdel-Aal told the emir that Egypt greatly appreciates the role of the Kuwaiti leadership in supporting Egypt's 30 June revolution and providing all financial assistance necessary to the country's economic reform march. "Egypt will also remain a big supporter of Kuwait's national security and Arab solidarity in general," Abdel-Aal told the emir, adding that "the security of Kuwait and the Arabian Gulf in general is a red line for the Egyptian leadership." "Egypt and Kuwait stand on one side and both share common interests and are keen on coordinating in all respects, particularly the area of fighting terrorism," said Abdel-Aal. The statement said Abdel-Aal's visit aims not only to reinforce relations with Kuwait, but also to coordinate with top officials there on the necessity of standing up to the conspiracies and challenges facing the Arab world. Abdel-Aal and Kuwaiti Prime Minister Sheikh Gaber Al-Mubarak Al-Sabah said they are happy that the joint Egyptian-Kuwaiti committee, headed by the foreign ministers of the two countries, are achieving great progress. "The committee held a twelfth round of meetings in November 2018 to push relations forward in commercial and economic terms," said Abdel-Aal. Al-Mubarak said Kuwait is happy that Egypt was elected chair of the African Union in 2019. "We will coordinate in this respect with each other on issues related to the Horn of Africa and the Nile Basin countries," said Al-Mubarak. Speaker of the Kuwaiti National Assembly also said that Egyptian-Kuwaiti relations represent a model to follow in view of the distinguished ties binding the two countries. The Egyptian parliamentary delegation includes secretary-general Ahmed Saadeddin, chairman of the African affairs committee Tarek Radwan, head of the Egyptian-Kuwaiti Friendship Association Hamdi Soliman, and MPs Ahmed Helmi Al-Sherif, Amr Ghallab, Zakaria Hassan, Ahmed Nashaat Mansour, Mahmoud Abul-Kheir, Essam El-Keky, El-Sayed Hassan, Gaber El-Tiwiki, Essam Saad Abbas, and Alaa Nagi. MP El-Feky told Ahram Online that Kuwaiti investments in Egypt have reached $3 billion. "As a result," said El-Feky, "the visit comes on time to send a message to Kuwaiti investors that they are welcome in Egypt, and that the attempts of some to do harm to Egyptian-Kuwaiti relations will go nowhere." A verbal clash between Egyptian and Kuwaiti parliamentarians erupted last November. A Kuwaiti MP, Safaa Al-Hashim, attacked Egypt's Immigration Minister Nabila Makram after the latter spoke in defence of an Egyptian expat who complained in a recorded video that she was assaulted by five people as she was having a walk in Kuwait City with her husband and children. Officials and parliamentarians in both countries were keen to contain the clash and "abusive remarks," agreeing that the Egyptian and Kuwaiti peoples respect each other and that they are against any campaigns aimed at destroying these relations.